I had visited Peru and Costa Rica before, but Tanzania was my first solo and real adventure. I have few and horrible photos from the late 90s so when I return I’ll give Tanzania more justice. 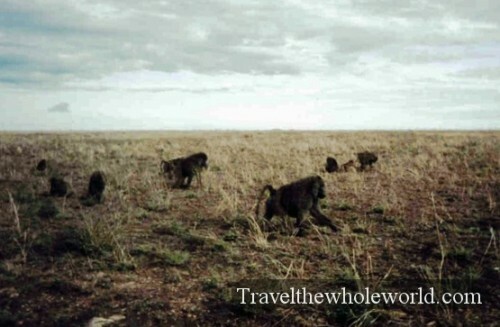 My two goals of traveling to Tanzania were to go on a camping safari and to climb Mt. Kilimanjaro. I began my camping safari spending a week seeing all kinds of huge game animals including the big five. The big five are the lion, rhino, buffalo, elephant and the leopard, chosen because of the difficultly to hunt them, not because of their size. Other animals I saw where Gazelle, hippos, cheetah, baboons, flamingos, several bird species along with huge herds of wildebeest and zebra. During my early travels such as this trip, my focus had always been wildlife and nature instead of visiting cities. Nature is still my priority during my trips, but I’ve also learned to appreciate the cities and towns of the different countries I visit. When I return to Tanzania, I plan to visit the exotic island of Zanzibar, the capital Dar Es Salaam, and various other parts of the country. 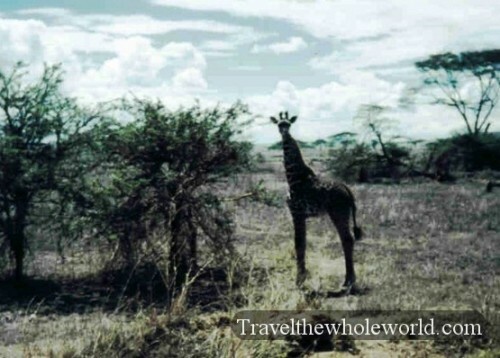 The two photos above were both taken in the Serengeti, which means endless plains in Swahili. 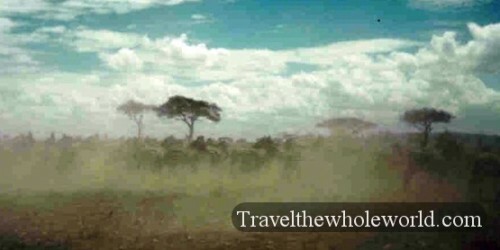 To the right you can see a herd of zebras running by. Because their stripes are black and white, they stand out to the human eye, but for lions which are color blind, the zebras are able to blend in better with the tall grass of the Serengeti. The left photo is of a Giraffe, which can grow up to 18 feet tall. 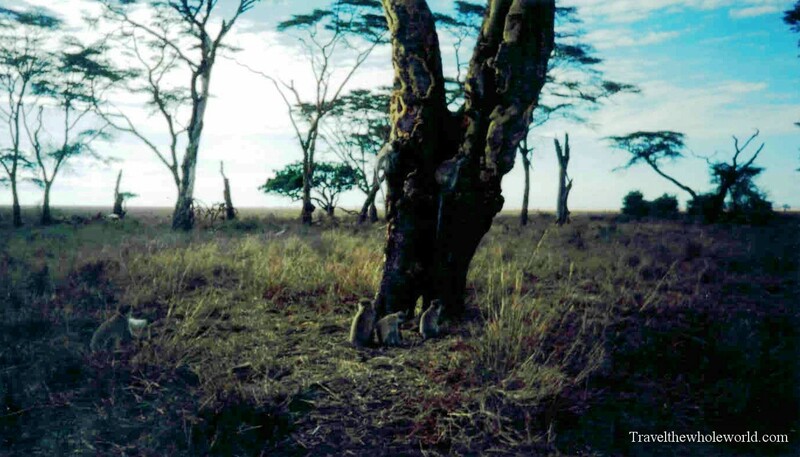 On the left is a group of baboons and on the right is a group of smaller monkeys hanging out by a tree. On the left is a lion in the Seregenti. The right photo is of the Ngorongoro crater which is collapsed volcano, or caldera and is home to tens of thousands of animals including the big 5. You cannot tell from my picture, but in person you could make out black spots in the distance which were actually herds of animals. 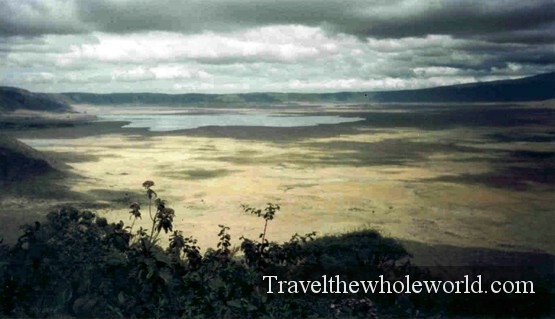 The crater has a large lake providing a fresh supply of water, and the surrounding crater walls are 600 meters tall. 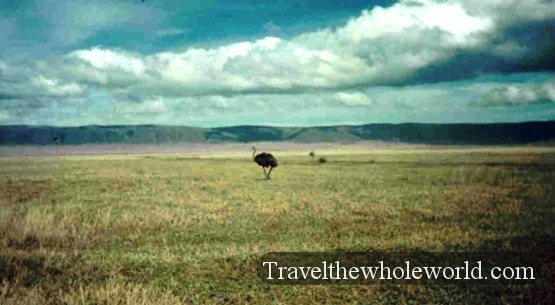 Inside the Ngorongoro crater is a ostrich seen on the left. 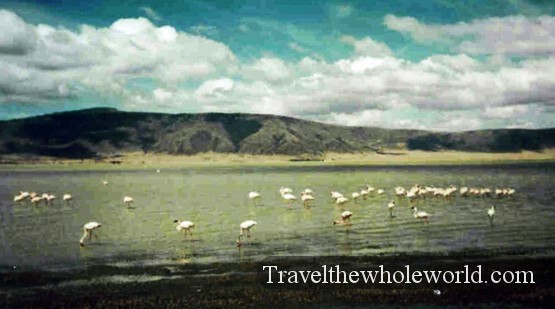 There is a large lake inside the crater which is often filled with flamingos. There are few flamingos in my picture to the upper right, but in the right time of the year the lake is completely full of them and all you see is a strong pink color.